On July 12, the I-49 South Coalition was present at the first meeting of the Governor’s Task Force on Transportation Infrastructure Investment. The Task Force was created to research, identify, and make recommendations on achieving sustainable recurring funding levels to address Louisiana’s $12.7 billion backlog in highway and bridge maintenance needs and on funding the construction of critical infrastructure projects across the state. Throughout this process, the I-49 South Coalition will continue to be engaged in advocating for the completion of I-49 South as Louisiana’s top transportation investment priority. Gov. John Bel Edwards’ newly minted task force on transportation began its months-long work today, with the governor directing the group of legislators, appointed officials and experts to help the state “prioritize” infrastructure. Edwards appointed the Task Force on Transportation Infrastructure Investment through an executive order in early June with hopes of overhauling the state’s roads, bridges and highways—a key campaign promise he made last fall. The committee is scheduled to deliver recommendations before the end of the year, which is around the same time another task force will advise Edwards and the Legislature on how to stabilize the state budget. The recommendations will help Edwards guide his 2017 agenda. The task force quickly introduced the gas tax as a means of funding for transportation projects. Department of Transportation and Development Secretary Shawn Wilson pointed to the problems that have arisen from funding highways with one-time money. Louisiana’s last major tax on gasoline, a 16-cent excise tax, began in 1984. In today’s dollars, Edwards and Wilson noted, that tax amounts to seven cents, since it was not indexed to inflation. Louisiana has a 38.4-cent total gasoline tax, which includes a four-cent state tax levied in 1990 for the TIMED program—which invested in highways, roads, ports and airports—and an 18.4-cent federal tax in 1993. Wilson pitched the gas tax as a centerpiece of tackling the multibillion-dollar backlog in infrastructure projects, noting that Louisiana ranks 40th in the country for state tax on gasoline. DOTD Deputy Secretary Eric Kalivoda highlighted the state’s aging bridges, most of which were built in the ’50s, ’60s and ’70s. The task force will travel throughout the state to get input from local communities and address infrastructure and economic development needs. Wilson said he will invite Louisiana Economic Development Secretary Don Pierson to work with the group on economic issues. A push that may produce the most sweeping changes in Louisiana’s roads and bridges in nearly 30 years gets underway Tuesday. A transportation task force named by Gov. John Bel Edwards is set to hold its first meeting. Six months later, it is supposed to make recommendations for the 2017 Legislature. Legislative, industry and business leaders are on the panel, which means any agreement also backed by Edwards stands a good chance of becoming reality. Proposals to increase the state gasoline and other taxes are likely. A plan to ease congestion in some of the state’s most troubled spots, including Baton Rouge, is also expected. If the task force reaches a consensus — no easy assignment — it could pave the way for the biggest transportation overhaul in Louisiana since the late 1980s. “This could be transformative,” said Senate Transportation Committee Chairman Page Cortez, R-Lafayette, one of the 18 members of the task force. “I will be disappointed if it doesn’t lead to some fundamental, concrete proposals moving forward,” said Commissioner of Administration Jay Dardenne, Edwards’ top lieutenant and a panel member. “The timing is certainly right,” Dardenne said. The last similar push took place in 1989, when voters approved funding for 16 road and bridge projects known as TIMED. The initial price tag for the 16 projects was $1.4 billion. The latest estimate is $5.2 billion, and two of the projects are still years away from completion. This year’s study group faces a daunting challenge. Louisiana has a long-standing, $12.7 billion backlog of road and bridge needs, including maintenance. It also has a $10.5 billion list of mega projects, including construction of a new bridge across the Mississippi River in Baton Rouge, that is part of the governor’s call for study. However, more money is needed to make it happen, right on the heels of $1.6 billion in tax hikes the Legislature took this year amid state budget problems. And more money means tax increases that require two-thirds majorities in the House and Senate — 70 and 26 votes, respectively. “Item No. 1 is going to be consideration of whether there is a straight-up hike in gas taxes,” said Robert Travis Scott, president of the Public Affairs Research Council and a member of the task force. But Scott said the panel first needs to take a look at how the state Department of Transportation and Development is spending money now, and whether there are ways to come up with more efficient operations. “Otherwise, it is going to be a very tough sale,” he said. 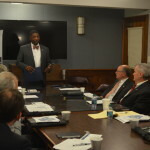 How DOTD spends its money now is one of the first items on the agenda for Tuesday’s 9 a.m. meeting, said DOTD Secretary Shawn Wilson, co-chair of the panel. Monthly meetings are likely. Regional gatherings are also on the agenda. Edwards is scheduled to address the group Tuesday. Not surprisingly, the 18-member panel has a clear tilt in favor of a sweeping transportation package. The influential Louisiana Association of Business and Industry, which opposed some of Edwards’ tax hike proposals during two special sessions this year, is notably absent from the committee. However, LABI President Stephen Waguespack praised the effort. He said task force member Reldon Owens, of Alexandria, a member of Blueprint Louisiana, gives LABI a strong voice. “There is no doubt the transportation issue is an enormous issue facing the state,” Waguespack said. Always congested Baton Rouge has to be one of the priorities, said Ann Trappey, an engineer, chairwoman of the board of the Baton Rouge Area Chamber and a member of the task force. Motorists pay 38.4 cents per gallon in Louisiana for state and federal gasoline taxes. That includes 16 cents for rank-and-file projects and 4 cents, and gradually more, to retire the TIMED project debts. Raising the gas tax is not the only possibility. Another plan would link the tax to inflation. A third idea would rely in part on public-private partnerships to finance mega projects. Allowing local communities to come up with their own transportation financing plans has been mentioned. So has a mileage tax. The task force kicks off its work just weeks after Edwards failed to win approval for some of his tax plans that needed two-thirds majorities in the Legislature. “We have seen that is not always easy,” Dardenne said. BATON ROUGE – Today, Governor John Bel Edwards and Shawn Wilson, Secretary of the Louisiana Department of Transportation and Development (LADOTD), announced that Louisiana will receive $60 million in FASTLANE grant funding from the United States Department of Transportation (DOT). The funding will allow the state to complete a nearly 15-mile pavement replacement and lane addition project between the I-10/I-49 interchange and the Atchafalaya Basin Bridge. In April, Gov. Edwards formally submitted the application for funding on behalf of the state. Gov. Edwards and Sec. Wilson began working on the application during the governor’s transition last year as a part of his overall policy agenda. This project will improve a portion of the interstate system that carried 120 million tons of freight worth $204 billion in 2015. The entire I-10 corridor is experiencing tremendous growth, but this is the most competitive section given the federal grant requirements. Traffic counts from 2016 indicate that more than 33 percent of all vehicles traveling on this portion of I-10 are freight related. Future freight flows are expected to grow by 55 percent, and the value of the freight will grow to an estimated $435.3 million. The entire project is estimated to cost more than $300 million. By investing in this project, the state will now have the ability to dedicate available funds to advancing other infrastructure projects. Those projects include construction of a new Washington Street off ramp in Baton Rouge, advancing the design of a reconstructed interchange at Loyola Avenue for the New Orleans Airport, improving railroad crossings on the freight-rail corridor between Baton Rouge and New Orleans, and advancing design of the I-20/220 interchange into Barksdale. Last month, Gov. Edwards announced the creation of the Task Force on Transportation Infrastructure Investment. The task force will make recommendations to Gov. Edwards to improve infrastructure in the state. Research, identify, and make specific actionable recommendations for achieving sufficient increased levels of recurring funding to address the transportation backlog in highway and bridge maintenance needs in Louisiana. Research, identify, and make specific actionable recommendations to be introduced in 2017 to fund a robust, multimodal construction program to address immediate needs that preserve the state’s investments in infrastructure and build “megaprojects” included in the Louisiana Statewide Transportation Plan, Priority A and Priority B.
BATON ROUGE – Today, Governor John Bel Edwards and Louisiana Department of Transportation and Development (DOTD) Secretary Shawn Wilson announced the formation of the Governor’s Task Force on Transportation Infrastructure Investment. This week, Gov. 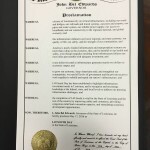 Edwards signed an executive order officially creating the task force. 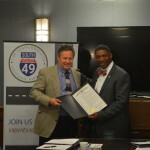 LAFAYETTE, LA — Today, the Louisiana Department of Transportation and Development announced that, in consultation with the Federal Highway Administration (FHWA), it will prepare a Supplemental Environmental Impact Statement (SEIS) document for the I-49 Connector project. Infrastructure matters. It matters, in big ways and in small, to our country, our economy, our quality of life, our safety, and our communities. Roads, bridges, rails, ports, airports, pipes, the power grid, broadband… infrastructure matters to companies that manufacture and ship goods. It matters to our daily commutes and our summer vacations. Infrastructure determines if we can drink water straight from our taps and flush our toilets or do our laundry. It brings electricity in to our homes. Ultimately, infrastructure matters to every aspect of our daily lives. That is why the I-49 South Coalition has teamed up with hundreds of other groups around the country including One Acadiana to participate in Infrastructure Week 2016. We’re raising awareness about the need to invest in transportation infrastructure, which is the backbone of our economy, locally and nationally. Transportation infrastructure is top of mind in Acadiana these days, and we know that every year that Louisiana fails to adequately invest in our transportation infrastructure our state becomes less competitive, our economy grows more slowly, and families and businesses lose valuable time and money. The goods we manufacture cost more when they get stuck on congested highways, rerouted around structurally deficient bridges, and stranded at outdated ports. In light of the state’s nearly $13 billion backlog in transportation infrastructure projects, it has been historically challenging to secure funding for I-49 South. U.S. 90 was not designed to handle the amount of traffic it now supports, and parts of U.S. 90 are currently handling more than one and a half times their daily capacity. Completion of I-49 South is within reach. More than 100 of the planned 160 miles of I-49 South are complete or currently under construction. Bringing the current U.S. 90 highway up to interstate standards will greatly improve a vital national link to “America’s Energy Corridor” while providing substantial benefits for economic development, safety, evacuation, and traffic congestion relief. In terms of economic development, top executives continue to rank a good highway system as the No. 1 or No. 2 most important factor when expanding, relocating, or starting a new business. Infrastructure matters. I-49 South matters. It’s time for all levels of government and the private sector to work together to rebuild, repair, and grow Louisiana’s infrastructure. BATON ROUGE — Louisiana’s I-49 South Coalition may be focused on filling the remaining gaps between Lafayette and New Orleans, but advocates said the “Energy Corridor” and its significance stretches all the way to Canada. “It has local, state, national and international significance,” said Jason El Koubi, CEO of One Acadiana. “This group represents business and industry all along the corridor who see the value in the project and are here to express their commitment to the project,” Wilson said. The coalition acts as an advocate to secure local, state and federal funding to compete the 160-mile stretch of I-49 from Lafayette to New Orleans. About 60 miles remains unfinished. Wilson said a ribbon cutting for a $62 million interchange at Louisiana 318 and I-49 is scheduled Friday just south of New Iberia in St. Mary Parish, which is sugarcane country. “I-49 is known nationally as the energy corridor, but its completion is also important to agriculture and as a hurricane evacuation route,” Wilson said. The I-49 South Coalition is participating in a panel discussion on the Lafayette Connector at the annual Louisiana Chapter American Planning Association Conference in Houma on March 4th. The theme of the conference is “Planning on the Edge” – exploring coastal restoration and resiliency, where the edges of urban and rural lines may be blurred, and how the edge of technology applies to planning. The keynote speaker is Jeff Carney, Director of the LSU Coastal Sustainability Studio and Associate Professor of Landscape Architecture. David Mann, Chairman of the I-49 South Coalition, is moderating a panel discussion titled “Interstates and Urban Fault Lines.” Panelists include Carlee Alm-Labar, Director of Planning and Zoning at Lafayette Consolidated Government, Stephen Wallace, Principal at Stantec, and Harry Weiss, VP of Urban Revitalization and Development at One Acadiana. The session will discuss the planning process that is currently underway for the Lafayette Connector, which includes the conceptual facility design, incorporating Context Sensitive Solutions (CSS) principles, as well as a TIGER-funded community planning scope. The Lafayette Connector is a key part of the I-49 South Coalition’s drive to complete I-49 South from Lafayette to New Orleans. More than 100 of the planned 160 miles of I-49 South are complete or currently under construction. Bringing the current U.S. 90 highway up to interstate standards will greatly improve a vital national link while providing substantial benefits in terms of economic development, safety, evacuation, and traffic congestion relief. The Louisiana Department of Transportation and Development this year will begin awarding hundreds of millions of dollars in contracts in highway projects for the Lafayette area. Work will begin in late 2016 to widen Interstate 10 to three lanes from Lafayette to the Atchafalaya Basin; and U.S. 90 will continue its transition to interstate status with work on interchanges and overpasses along U.S. 90 in Lafayette and southeast to St. Mary Parish, Bill Oliver, DOTD District 3 chief in Lafayette, said last week.